Posted September 5, 2014 by Kurt Henninger . You may have heard that in online marketing it is important to continually test things for different angles and different ways of presenting information in order to improve conversions and generate more leads from your website. That’s a pretty universal concept in any kind if Direct Response marketing, whether you are talking about Direct Mail, Magazine ads, Val Pack advertising or Digital Marketing. So how exactly do you do that online on a website? 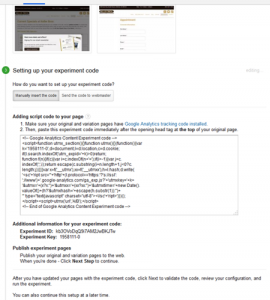 This is more commonly known as “split testing” and there are all different kind of things that you can (and should) split test: keywords, AdWords ads, landing pages, marketing funnels, etc. You should set-up a regular program of split testing everything from the moment someone sees your ad or page on any website all the way back to when they interact with your site and either call your phone number or fill out a form to become a lead. One of the most important thing to do is split test different pages on your website to increase conversions. If you are going to split test two different landing pages at the same time, you generally need some kind of software in order to properly do this. Fortunately, Google Analytics (you DO have some kind of analytics installed on your website, right?) has a built-in free feature that makes this fairly simple to implement. This test is officially known as a “Content Experiment” inside Google Analytics. Let’s review how to do this so you can increase conversions on your own website. Make sure you are measuring some kind of action such as a form fill-out, button click, or some form of business related statistic that you are trying to improve. A lot of times this would be represented as a Goal in Analytics that you would split test. 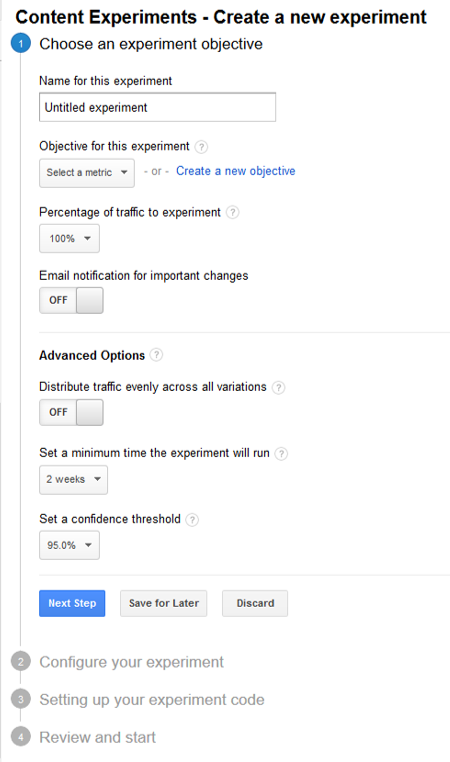 Inside your Google Analytics account, navigate over to Behavior Section on the side navigation. So, let’s go through each field and how to fill out the appropriate information. Name: Self-explanatory here, just whatever you want to call the experiment. Objective: This is where you decide exactly WHAT you want to test. You can select from a previously established Goal in your analytics account, or a few site metrics such as Bounces, Pageviews, and Session Duration. I recommend you choose a Goal already set-up in your Analytics account. Percentage of Traffic: Here you can decide how much of your traffic to any particular page you want to test. Email Notifications: If you’d like an email to yourself if something significant changes in the experiment. Distribute Traffic: You leave this “OFF” if you’d like to Google Analytics to send more traffic to the page that is performing better. 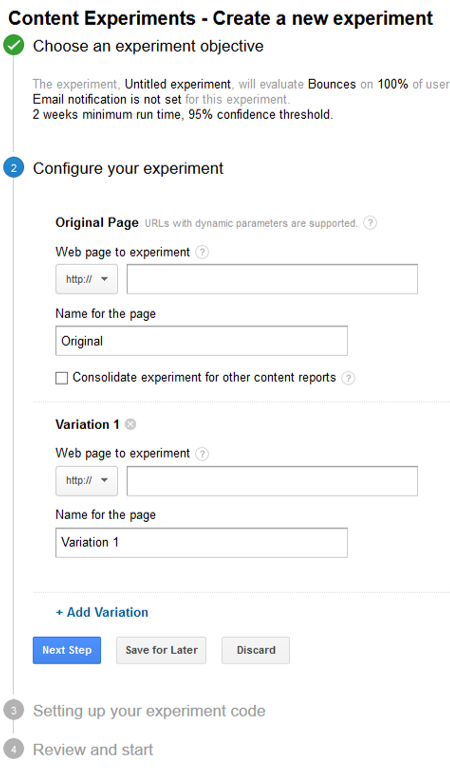 I recommend setting this to “ON” in order to distribute traffic evenly across the different pages in your Content Experiment. Set confidence level: This is a statics terminology which, without getting into technical jargon, shows how sure you can be about the results you have. The higher the number, the surer you can be about the results. Here, you now configure which pages (you can include more than 2) you want to test and even name them whatever you want. The last step entails inserting the code onto the top of the original page. Don’t worry though, you can just send this code to your webmaster or web designer and they can do this part for you. Once the code has been confirmed on the original page, just click “Start Experiment” and you are on your way. Have you ever done split testing on your website? What kind of results have you had? It may also require heavy capital and can depend heavily on cash flow. The amount saved is small in comparison on the lost capital investment. is certainly to Rebuild America on the Greatness that we believe she deserves. Thanks for sharing superb informations. Your site iis so cool. Bookmarked this website page, will come back ffor more articles. You are welcome to link back. Try clearing your cache or try a different browser, please.